Seraphinite, a deep forest green with feathery accents of silver-colored Mica inclusions. The name "Seraphinite" comes from the Latin word "seraphin" which refers to the first order of angels. The silver, feathery wing patterns made by the presence of Mica contained within the stone appear as angel wings. 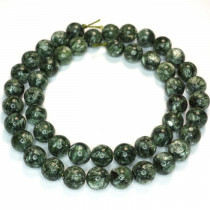 Seraphinite Round 8mm Gemstone Beads (~50pce Strand) - 40cm/16'" Strand.